Have gold coins or gold bars for sale? We want to buy your gold coins and bars! Did you buy gold coins or bars or perhaps inherited some gold treasures? 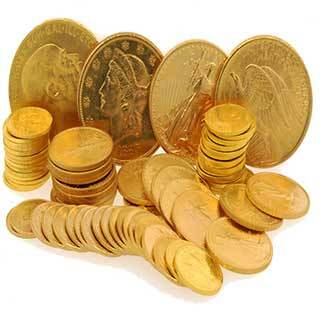 We are interested in buying American gold coins from the past and modern gold coins as well. We also want to buy Canadian, South African, and Mexican gold coins. Please feel free to call and discuss your coins and we can give you an approximate buy price. Sell gold coins and sell gold bars for much more cash. Gold coins are a great form of savings and investment because they will always have value. Another benefit of buying coins is their gold content is usually very close to pure gold and also clearly marked and government backed. We will pay no less than 80% of the full gold value of your coin, and as high as 90% or more for larger quantities. A one ounce gold coin has the same exact full value as the current spot price of gold that you see on the left. The price of gold was around $20 per ounce for 142 years from 1792 until 1935. Old US one ounce gold coins have a face value of $20 on them because of this and are referred to as double eagles. $10 coins from that time period are half ounce and called Eagles and quarter ounce coins have a face value of $5 and are called half eagles. Since that time, the price of gold has marched upward to a high a few years ago of around $1900 per ounce! 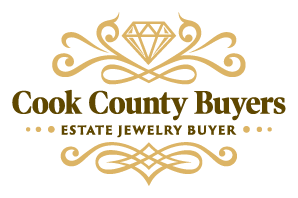 Cook County Buyers would love to be your choice for selling gold coins and bars. Whether you want to come to our private office in Skokie or meet at your favorite coffee shop, give Mike a call to arrange a meeting that is convenient for you! Please send an email, text or just give a call to discuss the gold coins you are interested in selling.